Flip through to see more samples of this pattern! FORMERLY THE MINI SWAGGER BY GEORGE AND GINGER, drafting is identical for the original sizes 2T-14 (baby sizes 0-3m to 12-18m now added!!) in tunic length. Purchasers of the previous version can get a 50% discount off the regular price by using the word at the top of page 10 of the instructions file, all in lowercase letters, with ‘usd’ at the end for USD purchase (code _________usd, no spaces), or ‘cad’ at the end for CAD purchase (code _________cad, no spaces). 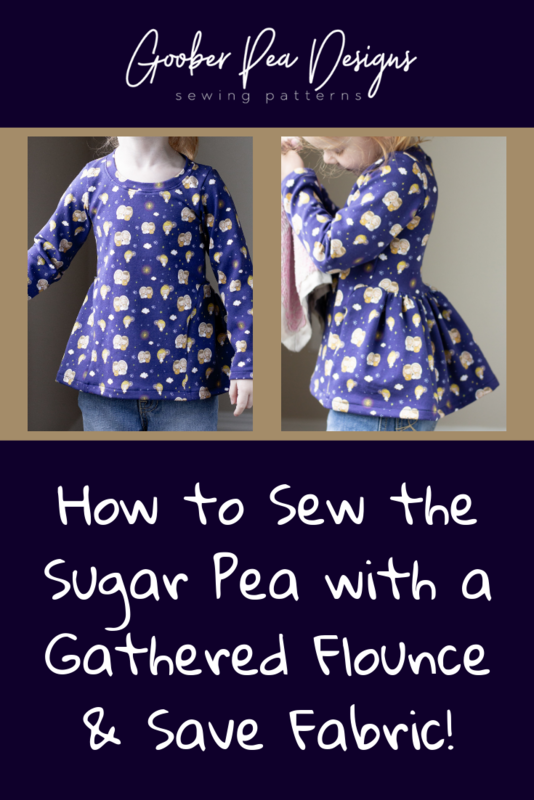 The Sugar Pea Tunic and Dress is a simple and beautiful sew with plenty of options – three sleeve lengths (plus sleeveless), two skirt lengths, and a big size range – 0-3 month up to size 14! There are even some special skirt options in the baby sizes – two tier or three tier, with a slightly higher dress length (above the knee) for the crawling babies. 12-18m and 2T are available in both baby sizes and regular sizes (knee length dress). This garment is drafted for knit fabric with 50% stretch and good stretch recovery. The tutorial has detailed information on choosing your fabric. NEW – Feb 2019 update, this pattern now includes a Relaxed Fit option (less fitted in chest/tummy) and Cuff option for long sleeves (including grow-with-me cuffs than can be folded up at first and then unfolded as the child’s arms grow longer). This pattern comes with LAYERS, so you can print only the sizes you need. It prints on both letter and A4 size paper, and can be assembled either by trimming the pages, or using the trimless guidelines to overlap the pages. The file bundle also includes a large format A0 file for copy shop printing. If you have questions about the pattern or need help, please feel free to email me at gooberpeadesigns@gmail.com, or join my group above – many of the members can also help if I am not online right away.